As the competition is heating up the claims of manufacturers about their products can cause a lot of confusion. So I am going to try to define the differences, the advantages, the liabilities and the uses of both the vertical block press and the horizontal block press. Sometime in the Early 50's a Columbian inventor designed the first Cinva Ram. This was a hand operated device that allowed one man to produce 2 to 3 hundred blocks a day and install them immediately. 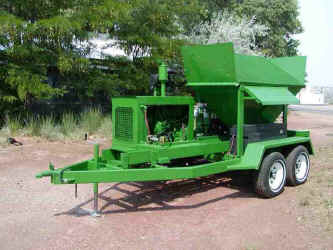 This one machine alone has revolutionized the Earth Construction business. The elimination of drying time and the increase of strength of the block made this a very desirable product especially in poor rural areas. You can see an improved model of this and more modern versions at www.ferncometals.com . Back in the early 70's there were a lot of different machines being developed and tested along with construction techniques. 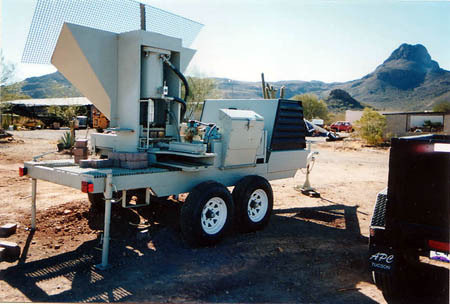 The Craterre organization had several machines (vertical) that they were using all over North Africa and in the Middle East. The information published as a result of their efforts has greatly enabled people all over the world in both the understanding of the machinery, the methods of construction and the credibility of the enterprise. In the Southwest U.S. several groups and individuals were also designing machinery and building homes. Many mistakes were made and as is common in a capitalistic society everybody tried to one up the other. This resulted in some pretty innovative designs and some pretty bad ones. Many were sold and are sitting in some ones yard as a testimony to their lost dreams and wasted money. We have a few of those, one we built and two we salvaged. WC Powell describes some of this process in his publication The Learning Curve of Design at www.adobemachine.com/designing.htm. There were five major issues that drove the conversion from the vertical press to the horizontal. 1 Feeding the mold with a uniform amount of materials. 2 The structure required to withstand the tonnage developed during the press cycle. 3 The height requirements of both the hopper and the ejected block. 4. Costs of the components. 5. Complexity of design and components. This wasn't easy to do because at the time dry stacking wasn't allowed and the New Mexico standard block size was 10" x 14" x 4" and the standard wall thickness was 10". So there was no advantage to go to a horizontal press except for the ability to overcome those five basic issues. A vertical press presses from the top or bottom of the block. if the block is 10 x 14 then the press area is on the 10 x 14 side, 140 sq in at 1500psi is 105 tons of force on the press structure. The resulting block is perfectly 10 x 14 but the thickness is not perfect, in order to maintain a uniformly thick block and uniform density between blocks the soils in each block would have to be identical in both volume of soil and moisture content, not possible. This irregularity is the same as that experienced by cast adobe and the cure is a mortar bed to level the blocks. that adds another expense as well as requiring a higher level of skill in the building process. However you can build either 10" or 14" walls. A horizontal press presses the block from the 4 x 14 end. this is 56 sq in at 1500 psi = 42 tons of force on the press structure. The resulting block is a perfect 4 x 14 x 2 to 12 inches, or a 4 x 12 x 2 to 8 ", which you can determine by the simple slide of a limit switch. but that last dimension is never perfect for the same reason BUT you can dry stack a wall about 4 times faster and with much less cost using basic skilled labor. So we think that is a pretty good trade off. Most of the people I have talked to that use a vertical press are targeting the ADOBE client which is high end, labor intensive, and architecturally challenging. We can do that, witness the home shown on Midwest Earth builders for the DeHaan family in Pella Iowa with a PDA-480-14dp, But dry stacking is best suited for production building. You can, with 10 people on site and the PDA-480-14dp produce and build (the walls) the equivalent of a 1200 square foot home a day. You can't do that with a mortared system in 4 days because the mortar has to dry. Our machines were developed by and are manufactured by us, We have continued to improve not only the machine technology but the construction technology as well. We use a minimal amount of micro circuitry (1 proximity switch) with all the rest electro mechanical. Our hydraulic circuit is designed by the BEST hydraulics designer in the business, My Dad, W.C. Powell, Our structure is the toughest, and we have standard equipment, accessories, machinery no one else has. We actually have designed, built and sold pressed earth block homes. Our customers have access to a web portal that promotes CEB construction as well as host their businesses or linking to their sites. We design and sell systems that are profitable for our clients, We service our product anywhere in the world and we consult with our clients, train their employees and hold their hands when they need it. We tell our clients the truth about soils, handling and mixing and we teach them how. One other thing. We have published a web site that voices our commitment to the CEB industry as the leading green alternative, can our competitors say the same? We are cross linked with Fernco, the only Cinva ram mfg around to make this technology available to everyone and we have continued to develop new, less expensive, machinery for the same reasons. In conclusion, I hope you get involved in CEB construction with someone. We would like to develop a relationship with you and teach you first hand about the advantages our machines offer as well as a very competitive construction process that will allow for a profitable and environmentally sound product.